Arrive at Xian Airport, where you are met and transferred to our hotel in the city. Our tour leader will greet you at a welcome meeting before our group dinner. We begin our adventure with a visit to the famed Terra-Cotta Warriors, considered the greatest archaeological find of the 20th century. Afterwards, we return to the center of Xian to visit the Bell Tower, the best-preserved and largest wooden tower in China. In the afternoon, see the Wild Goose pagoda, a well- preserved ancient and holy building for Buddhism. We conclude our sightseeing with a walking tour around the Hui minority area of Xian, ending at the Hui Grand Mosque, one of the oldest and largest mosques in China, with its combination of Chinese and Arabic architectural styles. Dinner and overnight in Xian. This morning we will visit the ancient City Walls of Xian by foot. Later visit the Shaanxi Historical Museum, built in the style of the Tang-Dynasty, it houses over 370,000 items from Chinese history, including murals, paintings, pottery, coins, as well as bronze, gold, and silver objects. In the afternoon we take the bullet train to Lanzhou and transfer to your hotel. Dinner and overnight in Lanzhou. We drive this morning to the Bingling (or 'Ten Thousand' in the Tibetan language) Grottos (UNESCO), a series of grottos filled with Buddhist sculptures carved into natural caves and caverns set in a canyon along the Yellow River. Construction dates back to the Western Jin Dynasty (265-316). To reach the grottos, we take a boat from the town of Liujiaxia, passing through the Liujiaxia Reservoir. Afterwards we continue on to the town of Xiahe for the evening. Dinner and overnight in Xiahe. Today we "step" into Tibet as we visit Labrang Monastery, the largest and most influential and major monastery of the Gelugpa (or Yellow Hat) sect of Tibetan Buddhism. The architectural layout follows a true Tibetan style while the construction patterns are a blend with Chinese styles. We have the entire morning to explore the monastery, which will be followed with lunch at the home of a local Tibetan family. Afterwards we depart for Lanzhou. After breakfast we transfer to the train station and take the fast train to Jiayuguan (approx 4 hours). Upon arrival in Jiayuguan we are transferred to a local restaurant for lunch. After lunch, we explore Jiayuguan Pass (Jiayuguan Fort) also known as the "Impregnable Pass under Heaven". 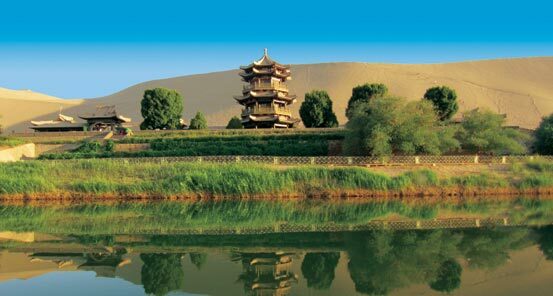 Jiayuguan is located on the western end of the Great Wall of the Ming Dynasty and is considered the most magnificent and well-preserved pass among over a thousand passes along the Great Wall. Later we visit the Great Wall Museum for a historical overview of the Great Wall, and then the Over-Hanging Cliff Great Wall. Situated outside of the city, this suspended wall is a part of the Great Wall and was originally built on a ridge at a 45-degree angle. We end this fascinating day with a visit to the Wei-Jin ancient tombs. Built between the 3rd and 5th centuries during the Wei and Jin Dynasties, it is renowned as the largest subterranean art gallery in the world and houses a great deal of colorful murals. Dinner and overnight in Jiayuguan. After breakfast, we drive to the historical city of Dunhuang where we will have lunch. 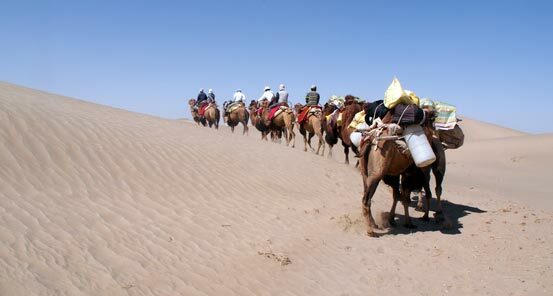 Later we explore Crescent Lake, a natural wonder of the Gobi Desert where you can slide down the massive sand dunes. The contrast between the golden sand hill and the blue lake are breathtaking. Dinner and overnight in Dunhuang. This morning is dedicated to exploring the UNESCO World Heritage Mogao Grottos. Constructed over a millennium from the 4th to 14th centuries, the caves are also known as the Thousand Buddha Caves and besides being the most-notable grottos in China, they are also considered the best preserved treasure house of Buddhist art, sutras, murals and sculptures in the world. In the afternoon we visit the Dunhuang Museum, which exhibits relics excavated from the local area, including paper and coins. The museum is also home to an excellent reconstruction of the Great Wall during the Han Dynasty. This afternoon we take a fast speed train to Turpan. Dinner and overnight in Turpan. We begin with a visit to the Ancient city of Idikut (Gaochang). 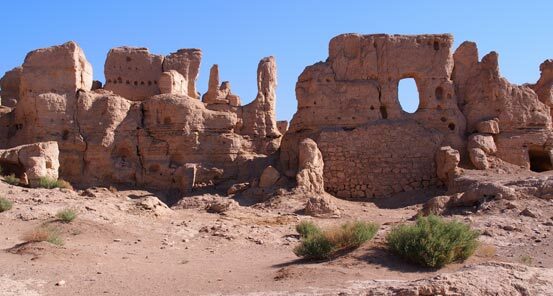 First built in the 1st century BC, Gaochang later became the capital of the Idikut (Gaochang) Uighur Kingdom in the 8th Century. After, we drive to the Karakhoja Astana Tombs, a Tang-dynasty burial ground which is also known as the "Underground Museum". Astana means "capital" in the Uighur language and Karakhoja is the name of a legendary hero of the ancient Uighur Kingdom who conquered a dragon. Later we journey to Toyup Village, an old, beautiful and timeless village with a friendly Uighur community. Here, we visit several local families and eat lunch with one of them in their homes. After lunch we visit the Bizeklik Thousand Buddha Caves, which used to be an important center for Buddhist worship under the Xizhou Huigu Government of the Idikut (Gaochang) Kingdom. We conclude our day with a visit to the Flaming Mountains; red sandstone hills that are part of the Tian Shan Mountain range. The glow of the setting sun against the red mountains is a wonderful end to our day. Today we visit Yargul (Jiaohe) Ancient City, which is considered one of the best-preserved ancient cities in China. The ruins of the buildings are divided into temples; civilian dwellings and government offices, Workshops and residential houses in the streets are still visible. After we go to see the world famous Karez Irrigation System, unique to this part of the world. The system is considered as one of the three great projects in China with the other two being the Great Wall and the Grand Canal. We also visit the Emin Suliman Minaret, which is a magnificent combination of ancient Uighur and Islamic architecture. It is the tallest ancient pagoda in Xinjiang and the only Islamic ancient pagoda in the country. Locals call it "pure tower." After lunch we'll continue on to Korla, arriving in the evening at our hotel. Dinner and overnight in Korla. We depart this morning for Kuche. In the afternoon we will explore the Old City of Kuche and its community of friendly Uighur people. Visit the Grand Mosque of Kucha. Built in the 17th century it is the only mosque to follow Sharia law (Islamic Court) in China. The roof of the mosque was constructed using 300,000 eggs, cement and bricks. Later we visit the ancient city of Subash dating from the 2nd and 3rd centuries as well as the Kizil Kagha Beacon Tower, an ancient military outpost. Dinner and overnight in Kuche. This morning we visit the Kizil Thousand Buddha Caves, which sits high on the cliffs over the northern bank of the Muzat River. The caves were hewn between the 3rd and 8th century and form one of the earliest Buddhist art treasure troves in China. These caves were also in use one century before the famous Mogao Grottoe at Dunhuang. After lunch, we drive to the Tianshan Mysterious Grand Canyon, noted for the unique color and shape of its mountains. Today the Tianshan Great Canyon is regarded as one of the ten most beautiful canyons in China. Later we drive to Aksu for dinner and overnight. We depart Aksu after breakfast and head for Hotan. We travel along the new highway opened in 2007, following the route of the Hotan river, which was also a significant ancient trading route. Dinner and overnight in Hotan. Today we will drive into the Taklamakan Desert for a very unique and memorable experience. Once we arrive at our starting point in the Taklamakan, we have our luggage and supplies loaded onto camels as we begin our desert trek. Our camels are Bactrian camels, which are native to the steppes of Central Asia. They are larger, have 2 humps and are much more rare than the single-humped dromedary camels. We can trek on foot, or on camel, or both. Enjoy a picnic lunch amid the dunes before we continue on to our campsite for the evening. Dinner and overnight at our campsite in the desert. We rise early this day to witness the sun rise over the high sand dunes before we pack up our camels and head out of the desert. Enjoy a shower in the hotel to wash away everything but the memories! We begin our day with a visit to an old mosque and ancient shrine located about 28km from Hotan, before stopping at a mulberry tree traditional papermaking workshop. Later, visit the local carpet, silk and jade factories, all of which are unique only to Hotan. In the afternoon, we continue to Yarkand with a stop in Kaghilik (Yecheng) to visit the Kaghilk Grand Mosque. Dinner and overnight in Yarkand. Today we will explore Yarkand, the ancient capital of several Uighur Kingdoms and a vital station on the old Silk Road. Yarkand can trace its history back almost 2000 years. We visit the Golden Mosque (built in 1533) and its graveyard, including several hundred-year-old tombs. This evening enjoy dinner with a local Uighur family in their home. Dinner and overnight in Kashgar. Today is an early start as we set out along the Karakorum Highway, one of the most beautiful roads in the world. The hues and colors of some of the world's highest mountain ranges dominate every horizon on our journey towards Karakul Lake as Kyrgyz nomadic herders and ancient caravanserais dot the vast landscape. Karakul Lake (which means 'great' lake ) sits at the foot of the - Muztagh Ata (7546m) and Kongur (7719m) mountains. 'Muztagh Ata' means Father of the Ice Mountain and is one the most beautiful and mysterious mountains in the world. We will enjoy a picnic lunch on the shores of the lake before continuing on to Tashkurgan, an important hub on the old Silk Road. The name Tashkurgan is actually a translation of 'Stone Fort.' This whole area around this Tajik town borders Pakistan and Afghanistan and is connected to them via the Khunjerab Pass. On the way into Tashkurgan there are many Tajik villages and nomadic herdsman. In Tashkurgan, we explore the town's ancient stone fort - still standing after 1800 years! We also visit the Tashkurgan Historical and Cultural Museum and walk around this historic town. This is a fantastic opportunity to try traditional Tajik food and immerse yourself in the culture of the Tajik community. Dinner and overnight in Tashkurgan. We leave for the Khunjerab Pass at 8am local time and travel 81 miles (130 km) from Tashkurgan to the peaks atop of the nearby Karakorum Mountain Range. Khunjerab means 'Valley of Blood' in Uigher. 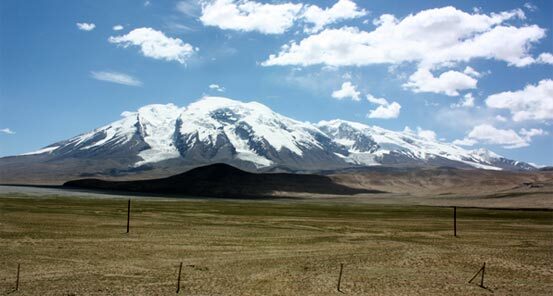 Many caravans once died summiting this pass on the old Silk Road as the area was famous for brigands and bandits. We travel the Wahan corrider passing small Tzjiki villages and if local authorities permit, we will summit the pass and enter into an amphitheatre of fluted peaks atop the highest border in the world, a place few people on Earth can ever claim to have been. This morning we visit Karakul Lake, located 11,800 feet above sea level. The lake is surrounded by a series of mountains and at the lakefront there is grasslands where herds of yaks can be observed. In the afternoon, we drive to Kashgar. Today we explore the rich, endless culture of the Uighur people in Kashgar. Our first stop is the Livestock Market, which is considered the most interesting and traditional part of the famed Sunday Market. Later, we visit the largest bazaar in Central Asia at the Kashgar Sunday Main Bazaar. In the afternoon, we visit the Id Kah Mosque, the largest mosque in China with its intricate architecture and Kashgar's historic Apak Hoja Tomb, which is also known as Fragrant Concubine Tomb. We'll also spend time in Kashgar's Old City before heading to the airport for our flight to Urumqi. This morning we pay a visit to Heavenly Lake, a beautiful crescent-shaped lake with crystal water and surrounded by mountains. It provides some stunning photo opportunities. We return to the city and visit the Dongkuruk Bazaar, which contains many local goods including rugs, carpets, handicrafts & sweaters. This evening we can reflect on our epic Silk Road journey during our farewell dinner. Farewell dinner and overnight in Urumqi. 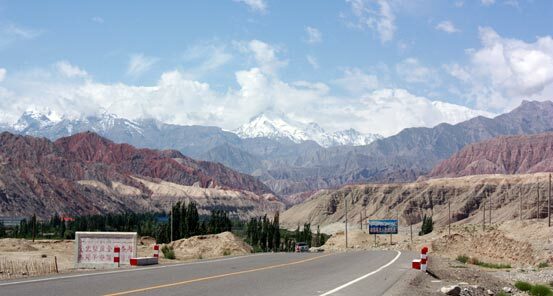 Our Chinese Silk Road adventure concludes today with a transfer to the airport for your departing flight.